Much remains to be learned about how charge moves along the molecules that make up the layers of materials in solar cells. These details have remained hidden because of the challenges of direct, real-time observation of motion of electrons and their holes at interfaces where two solar-cell materials meet. Using ultrafast extreme ultraviolet pulses, researchers watched as holes were injected across the interface materials found in hybrid perovskite solar cells. The bursts of extreme ultraviolet light were only femtoseconds in duration. The bursts allowed ultrafast, element-specific measurements. The experiments revealed what states of the nickel atom are the primary hole-acceptors. Learning how charge moves in the material layers of solar cells could reveal missing design parameters. These parameters could let scientists control how charge moves inside solar panels or LEDs, including future designs based on novel materials. Detailed knowledge of real-time motion of charge in solar-cell materials could help scientists and engineers design better solar cells. Here, scientists need to manage both electrons and the holes that are left behind. Specifically, they need a way to collect and move electron holes, the spots where electrons could be but aren't. But there's a problem. The surface states of oxide materials that facilitate hole transfer are hard to study because it is difficult to probe directly between layers of materials, and the charge dynamics are extremely fast, making it difficult to follow them in real time. Researchers devised a new way of examining charge transport within layered materials. Their new approach let them watch in real time how holes form and how the resulting electrons move, and they demonstrated the method by characterizing the interface formed with nickel oxide atop iron oxide. The method employs extreme ultraviolet reflection–absorption spectroscopy using tiny bursts of extreme ultraviolet light only a few femtoseconds in duration. The short bursts allow real-time measurement of electron dynamics, and the burst energy allows element-specific measurements within layered materials. They found that a transient nickel ion (Ni3+) forms after sunlight excites the underlying iron oxide layer. This tells the researchers how the holes in the nickel oxide work. 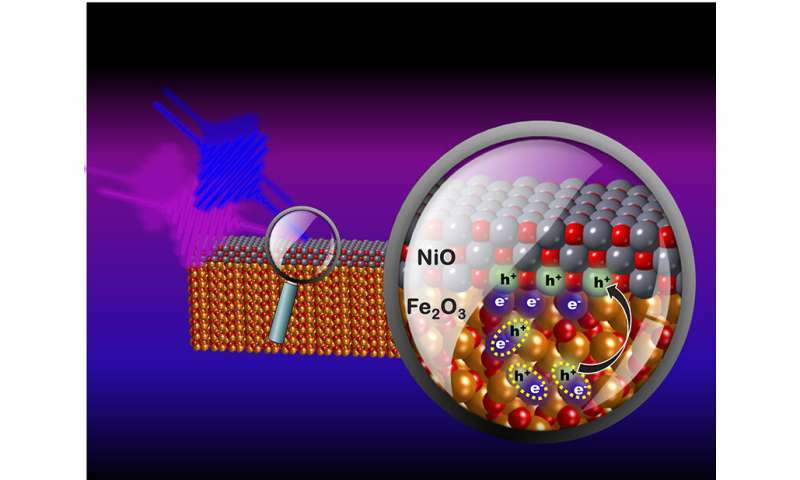 In addition, the team's work showed that holes are injected into the nickel oxide layer via a two-step process starting with a fast, field-driven exciton (electron-hole pair) dissociation in the iron layer. With this research, scientists revealed the chemical nature of the hole acceptor state in nickel oxide. Also, they showed how exciton dissociation and interfacial hole transfer occur at the interface of nickel oxide and iron oxide, a model interface.